Part Four: Business Operations Basic RequirementsChoosing the Right Delivery MethodChoosing the right delivery method involves not only deciding where your business will be located, but also how you intend to operate your business. Since you are going to be operating an inflatable business, your likely choice of location may be your home. This is if you have a specific location laid out in your home for your office. If you choose to have your office in your home, you don’t need much in the way of space, you just need room for a computer, your phone, a desk, and chair. If you live in a small house, you may have to resort to having a small office in another location. If that is the case, you should consider a small place to keep the expenses down.There is a lot to consider regarding where to house your office. You have to consider zoning laws, in case you decide to place your bouncing toys in a storage facility at your home. If your office is someplace else, you still have to consider zoning laws as the place where your office may be a combination residential and commercial area. But the question is what part is residential and what part is commercial. You will need to check into all this because when clients come around to see you, a professional atmosphere is required. Can you have such an atmosphere at home? For more information on zoning laws for home based businesses visit http://smallbusiness.dnb.com/specialty-businesses/home-based-business/3348-1.html. The way you deliver the goods has to be considered. If you are going to be involved in delivery of large inflatables, you need to know whether you are going to deliver the equipment yourself, or are you going to have the supplier deliver the equipment for you. This you will need to know ahead of time. It is best for you to know before you begin booking the job what the supplier will or will not do. If the supplier is willing to deliver for you directly, you have nothing to worry about, except to make sure the supplier has the correct address. If you are going to pick up the equipment yourself, you’ll need a vehicle to carry it in. This may mean renting a U-Haul, or trailer. You’ll have to apply for commercial tags if you are going to drive a commercial vehicle. You may want to invest in a storage truck (not a U-Haul). This is a white truck that many businesses use to transport produce and other types of goods around. It is quite spacious and can hold a lot of stuff. You could also rent or purchase a large pickup truck with the ability to tow trailers. You can place certain items in the cab and tow the rest. If you don’t want to buy a pickup you may want to purchase or rent a van. The problem with a van is it doesn’t hold as much as a truck, unless you hook up a trailer to it. There are also box trucks. These are large trucks that are shaped like boxes. They do hold a lot of stuff as well. Many people use them for moving furniture, but you could purchase one for storing your inflatable toys and for moving them around. 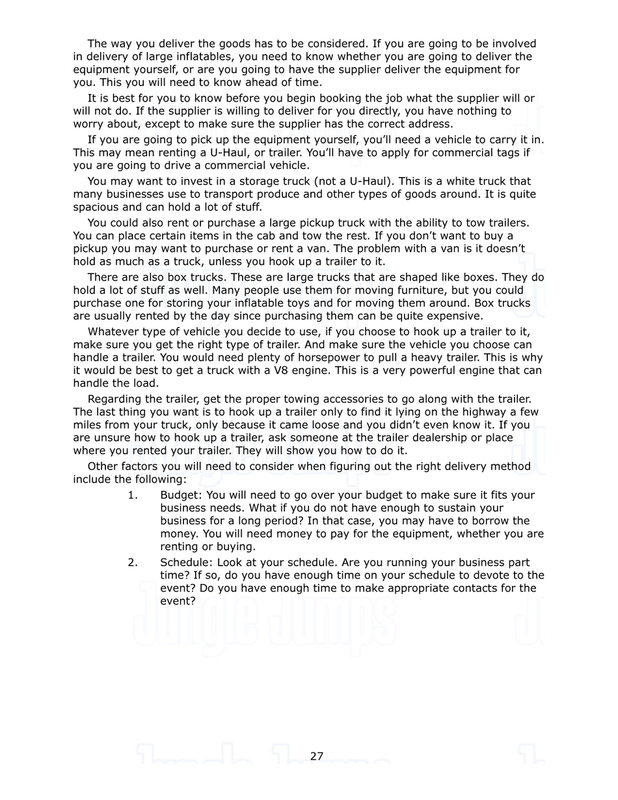 Box trucks are usually rented by the day since purchasing them can be quite expensive. Whatever type of vehicle you decide to use, if you choose to hook up a trailer to it, make sure you get the right type of trailer. And make sure the vehicle you choose can handle a trailer. You would need plenty of horsepower to pull a heavy trailer. This is why it would be best to get a truck with a V8 engine. This is a very powerful engine that can handle the load.